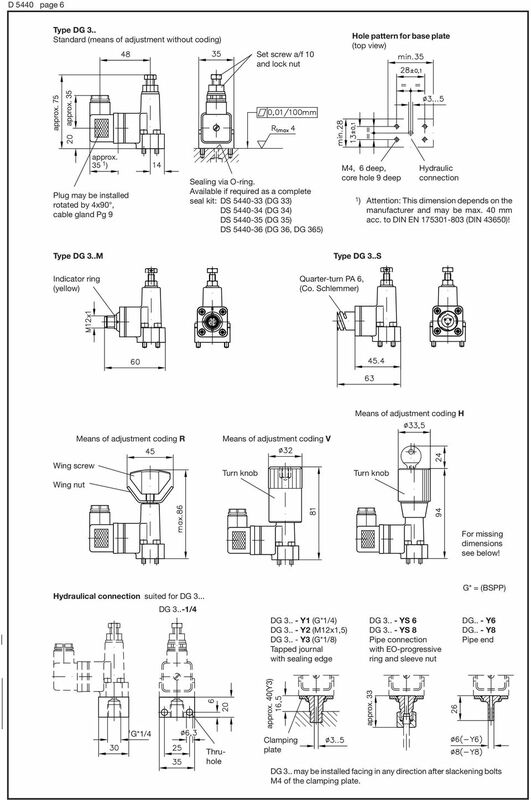 Download "Electro-hydraulic pressure switches type DG"
6 D 5440 page 6 Type Standard (means of adjustment without coding) Set screw a/f 10 and lock nut Hole pattern for base plate (top view) approx. 75 approx. 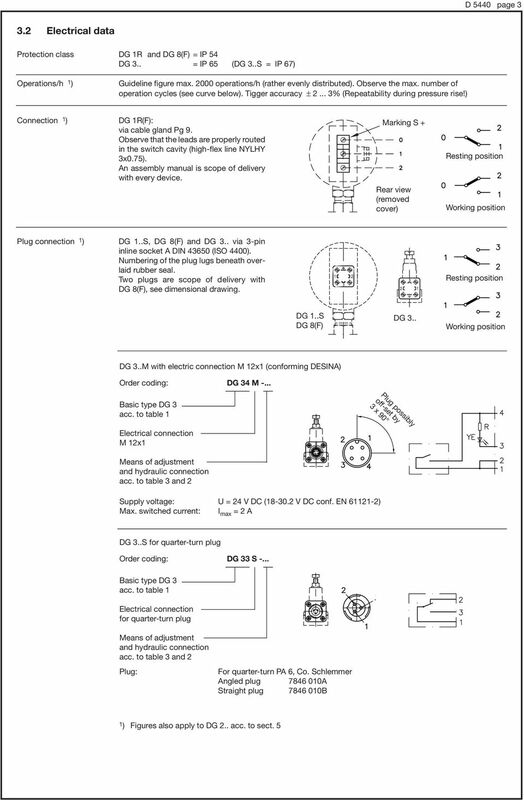 35 approx ) Plug may be installed rotated by 4x90, cable gland Pg 9 Sealing via O-ring. 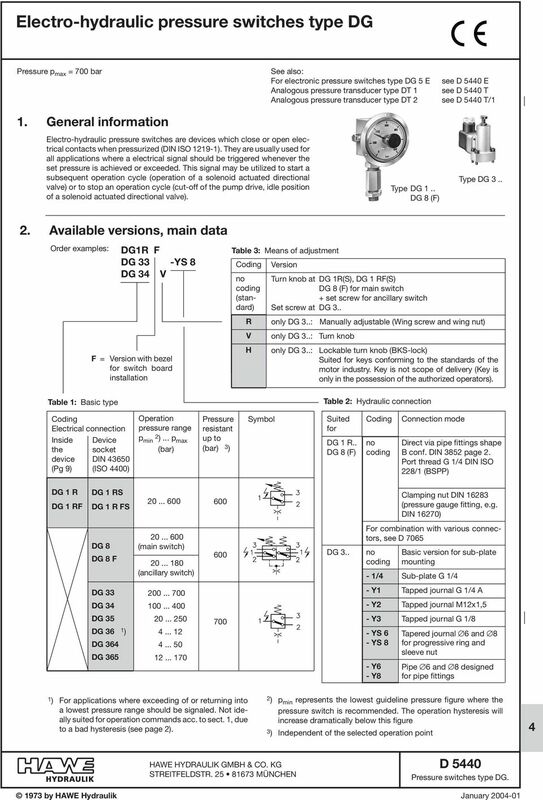 Available if required as a complete seal kit: DS (DG 33) DS (DG 34) DS (DG 35) DS (DG 36, DG 365) M4, 6 deep, core hole 9 deep Hydraulic connection 1) Attention: This dimension depends on the manufacturer and may be max. 40 mm acc. to DIN EN (DIN 43650)! 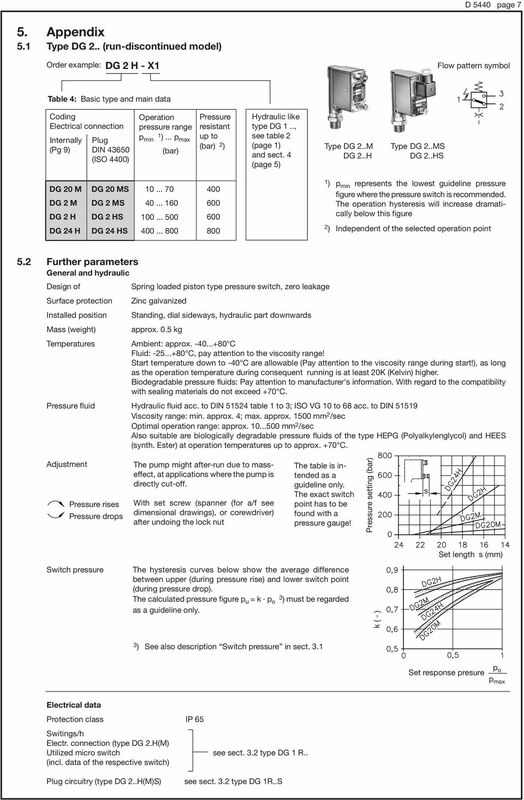 Type M Type S Indicator ring (yellow) Quarter-turn PA 6, (Co. Schlemmer) Means of adjustment coding H Means of adjustment coding R Means of adjustment coding V Wing screw Wing nut Turn knob Turn knob For missing dimensions see below! Hydraulical connection suited for. -1/4 - Y1 (G*1/4) - Y2 (M12x1,5) - Y3 (G*1/8) Tapped journal with sealing edge - YS 6 - YS 8 Pipe connection with EO-progressive ring and sleeve nut G* = (BSPP) DG.. - Y6 DG.. - Y8 Pipe end G*1/4 Thruhole approx. 40(Y3) Clamping plate approx. 33 may be installed facing in any direction after slackening bolts M4 of the clamping plate. 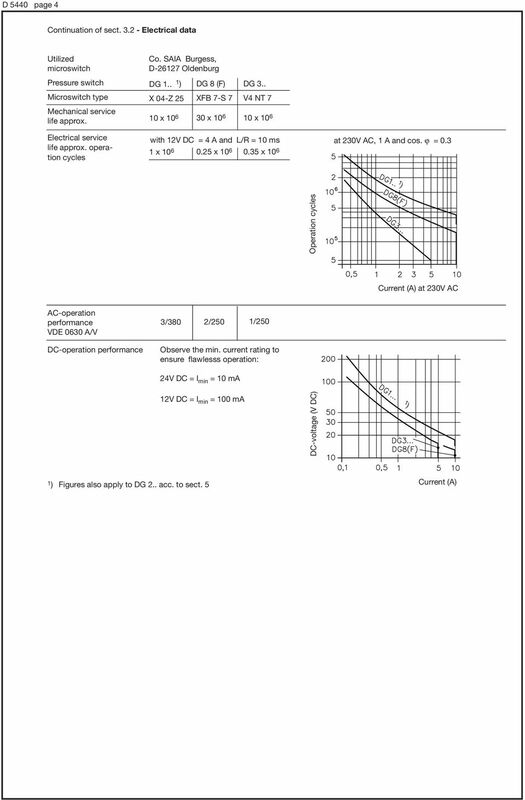 8 D 5440 page Unit dimensions All dimensions in mm, subject to change without notice! Type DG 2.. Cable gland Pg 9 p max. 0 bar Thru-hole 5.2 for mounting Switch hausing Earth connection Set screw a/f 9 Lock nut a/f 24 a/f 27 Actuation cylinder Max. 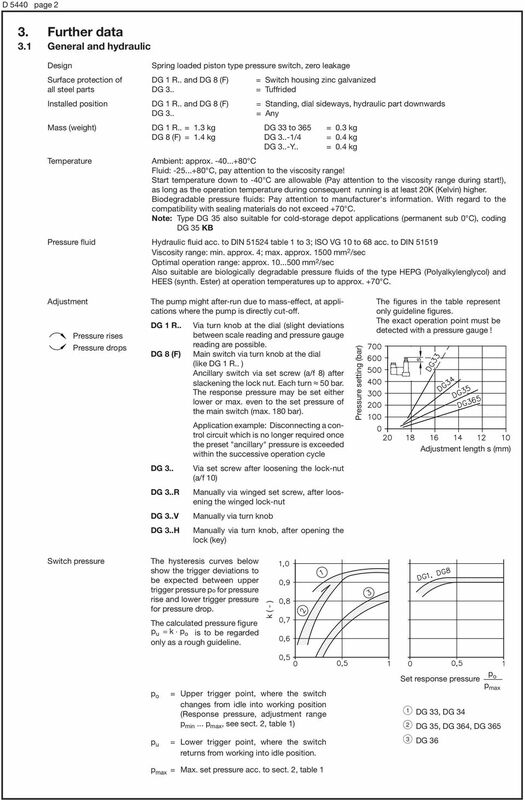 adjustment length Pressure drops Pressure risse G*1/4 G*1/2A Hydraulic connection like type DG 1R.., see sect. 4 on page 5 Type DG 2..S G* = (BSPP) approx. 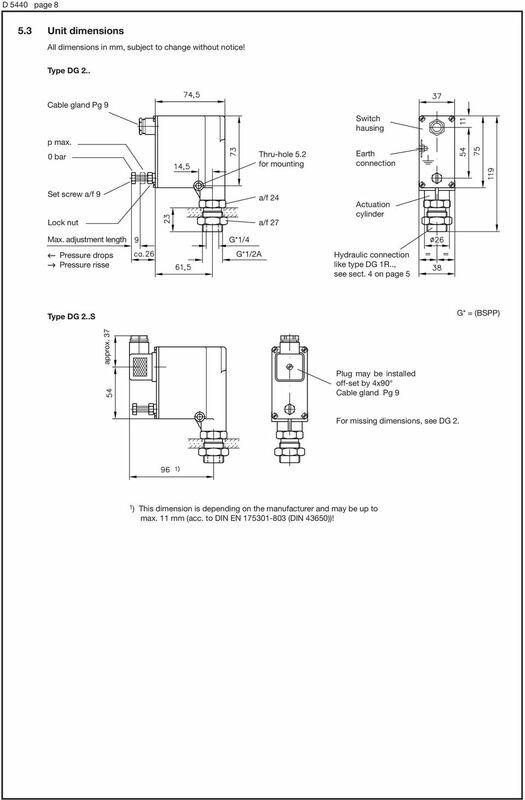 37 Plug may be installed off-set by 4x90 Cable gland Pg 9 For missing dimensions, see DG 2. 1) This dimension is depending on the manufacturer and may be up to max. 11 mm (acc. to DIN EN (DIN 43650))! 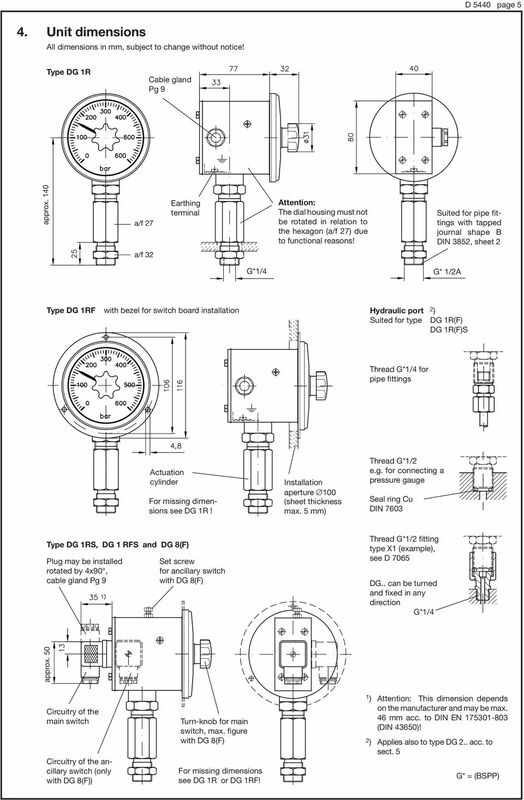 STAUFF Pressure Switches Local Solutions for Individual Customers Worldwide Stauff Pressure Switches Stauff pressure switches are versatile, economically priced units with good hysteresis characteristics.